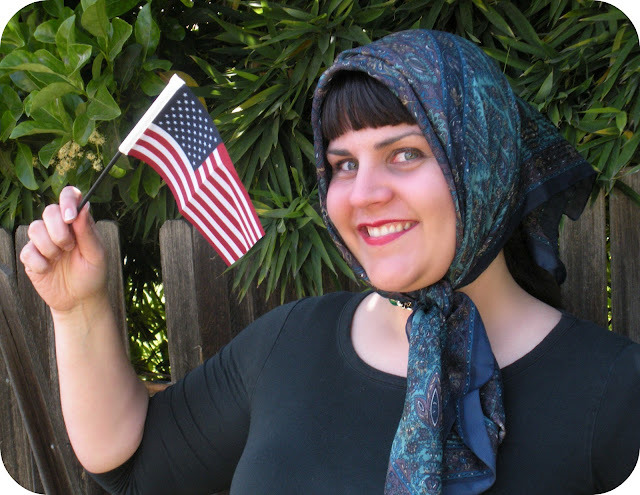 Fritzi Marie: Happy Birthday, America. Happy Fourth of July Dear Friends. We are having a lovely day. Roscoe is wearing little shorts with flags on them and Bono B. is wearing his red and white gingham neckerchief. The grill is warming up and the sparklers are ready to be lit. For now we are watching the National Treasure movies. It's a silly little tradition Daniel worked up a few years ago. I had to quickly watch Little Edie's clip from Grey Gardens because I love it so. This is a photo from a few years ago when I dressed up like Little Edie (just for fun). We hope you are having a wonderful holiday. p.s. Please bring your puppies inside tonight. Fireworks are scary.